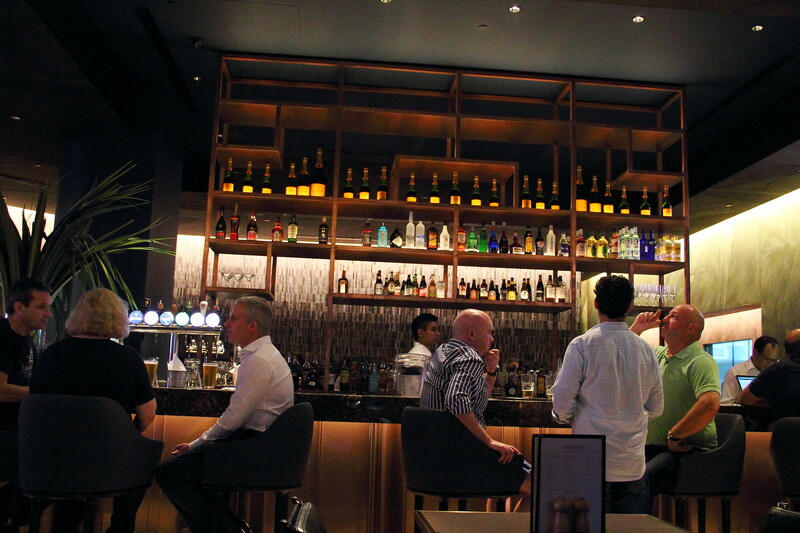 Feeling that the F&B scene is lacking a classic American grill restaurant in Singapore that is up to standard with reasonable pricing, owners John Stevens and Matt Connors together with Chef Nicolas with 18 years of culinary experience under his belt, came together and opened RedBank Bar & Grill Restaurant at the renovated Claymore Connect where Tony Roma used to be. 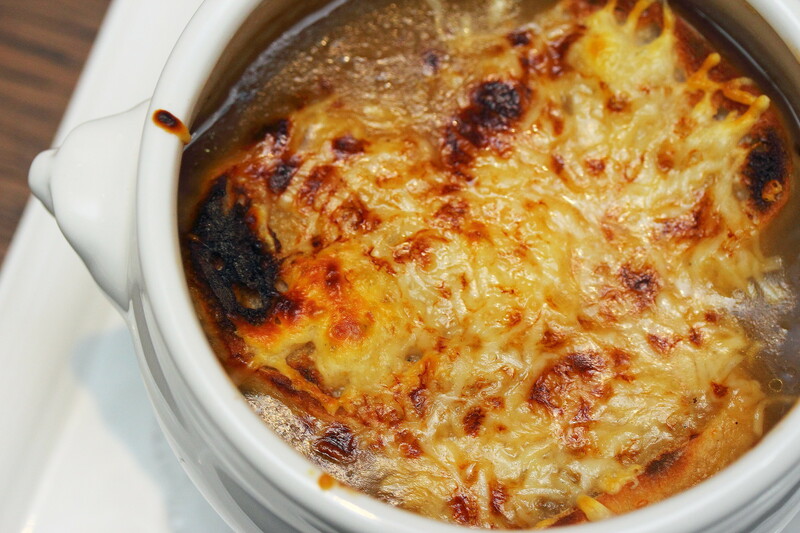 We started our dinner with the the French Onion Soup ($15). Actually it did get me a bit confused why the dish is on the menu for an Amercian grill restaurant? Nevertheless, the depth of the beef stock and sweetness of the caramelized onion made this classic french soup one of the best I have eaten. 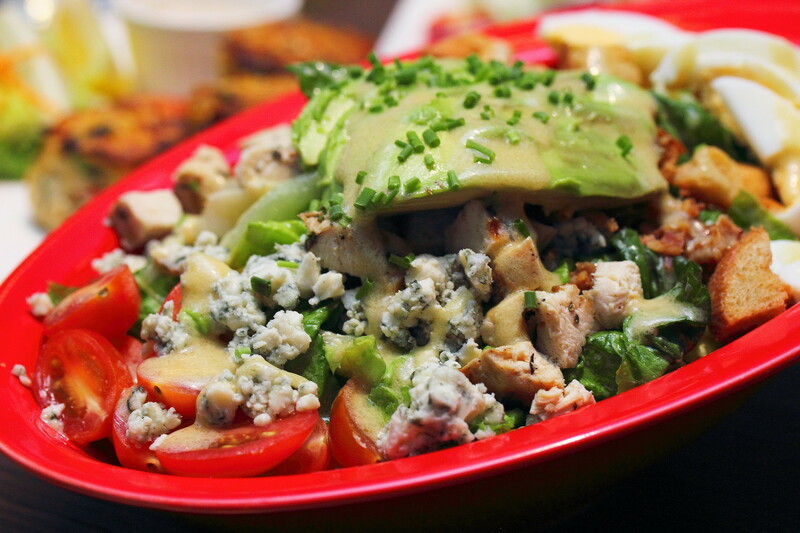 The Brown Derby Cobb Salad ($22) comes with iceberg, avocado, egg, bacon, cheese and chicken. History says that the dish was invented back in the 1930s by Robert Howard Cobb, owner of Hollywood Brown Derby restaurant. As he has not eaten near midnight, he mixed together what he could find in the kitchen together with some bacon. It then became instant hit and became one of American's classic dish. The Virginia Style Oyster Biscuit ($18) was rather interesting but pale in taste. Who would have thought of servicing deep fried oyster in a buttermilk biscuit? The buttermilk biscuit was good but the oyster got lost in combination. I thought it was quite a waste for such a delicacy ingredient. Another dish that did not appeal to me is the Virgina Style Crab Cake ($18). I felt that the crab cake has a mushy texture which I did not quite enjoy. The sweetness of the crab's flesh was also not quite distinct in the execution. In short, I have had better ones elsewhere. The typical American backyard grill experience is brought indoors with the used of the Josper charcoal grill. 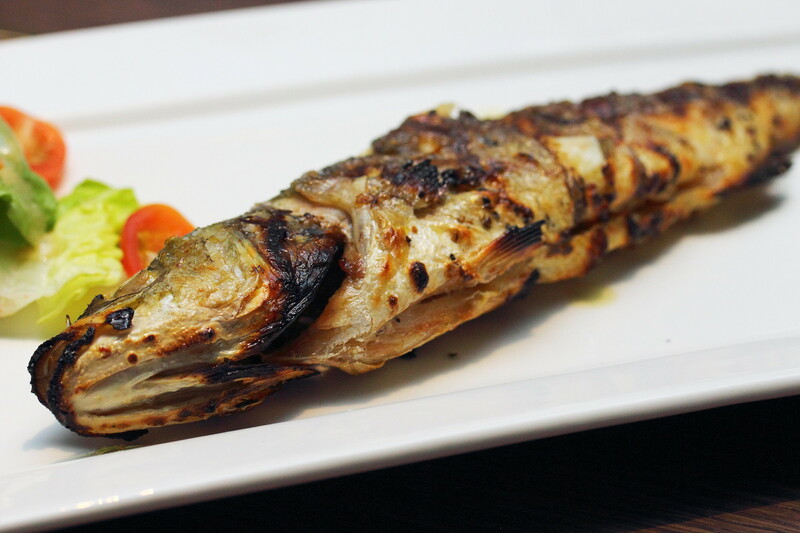 The Grilled Whole Sea Bass ($33) is cooked to a delectable charred on the skin while retaining the moist and natural sweetness of the fish. The Mixed Seafood Grill ($33) on the other hand allows one to have a bit of everything. 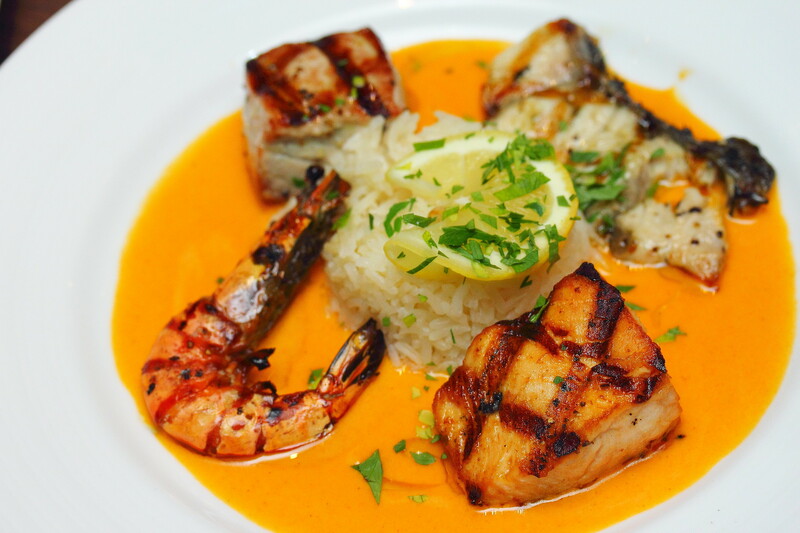 On the plate, there was grilled prawn, salmon, sea bass and tuna served with rice. 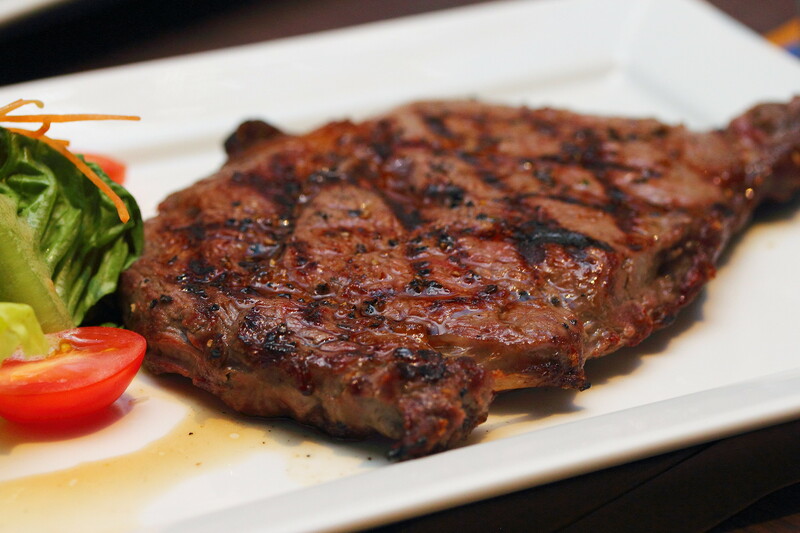 Showcasing on Redbank's menu is a great selection of US beef and different cuts. We tried the Rib Eye (330g for $45/ 500g for $65), which is lightly seasoned with salt and pepper, and perfumed with an aromatic charred and smokiness to the meat. 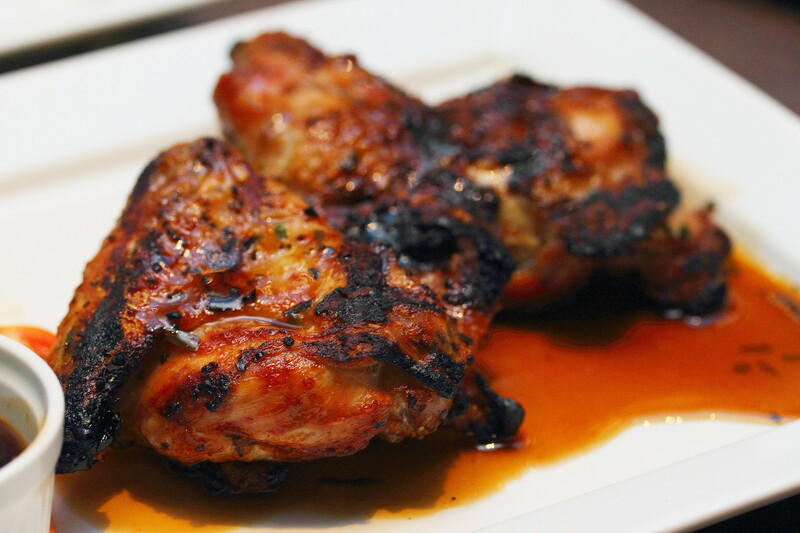 The Grilled Deviled Chicken ($28) stood out for me among all the grilled meat and seafood I have tried. The chicken with its tender and juicy meat seemed to showcase the Josper charcoal grill more. I could paint the image of having a backyard grill party while tearing the delectable chicken apart with a bottle of beer. On the menu, there are also a extensive selection of sides to go with the mains. 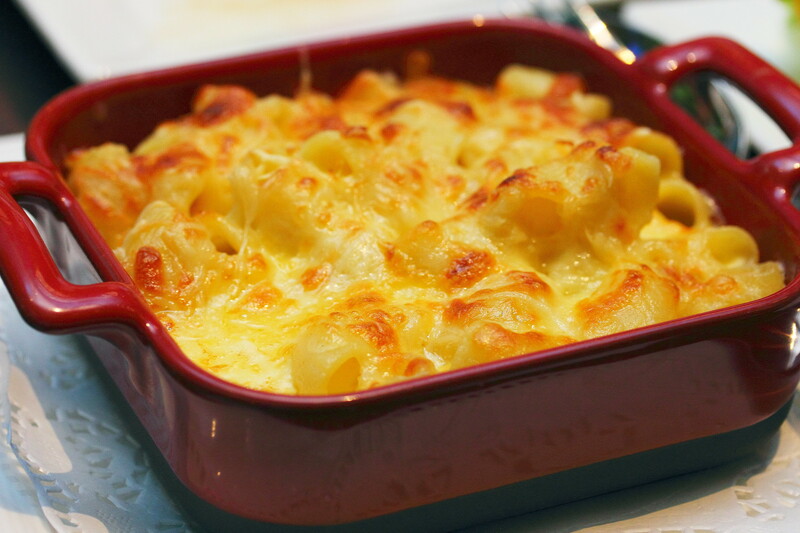 The classic Mac & Cheese ($12) with gratin topping will delight any cheese lover. However the flavour was not as rich or cheesy as I would have love. One of the sides on the menu I would recommend is the Twice Baked Potatoes ($15). 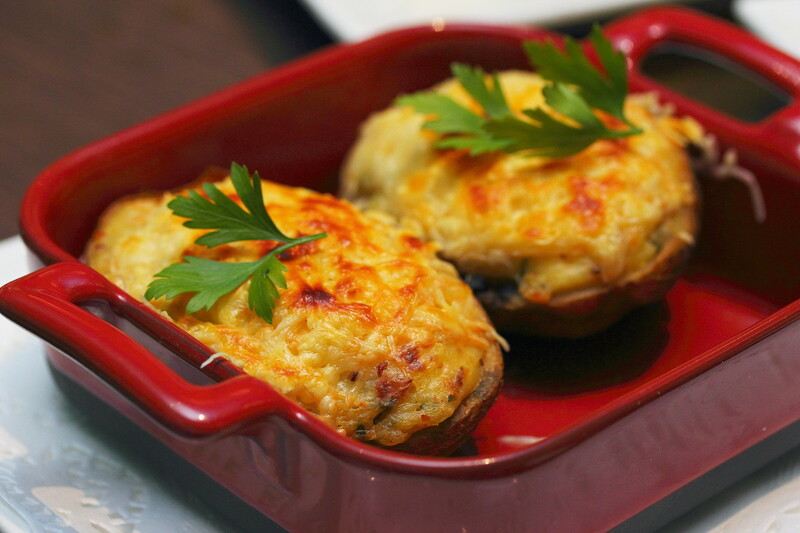 The baked twice potatoes has a contrast yet complementing texture enjoyment topped with sour cream, emmental cheese and chives. 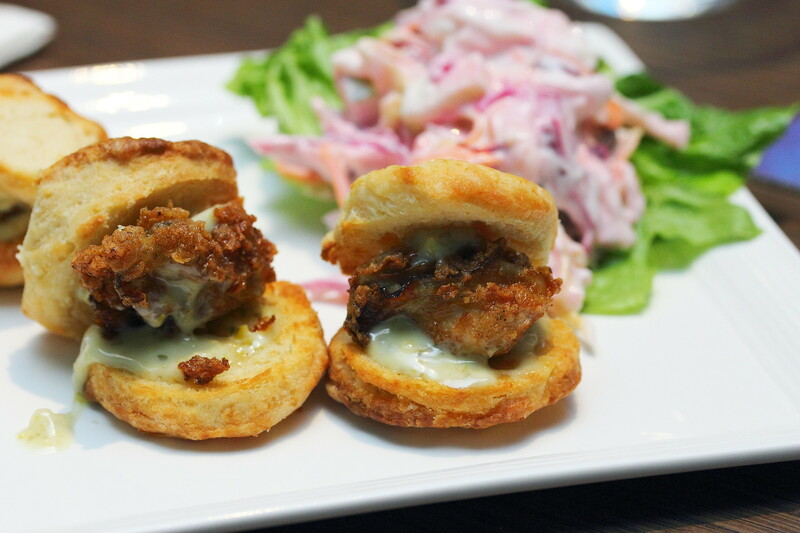 An interesting name on the sides menu caught many of our attention is the Hush Puppy ($12). We have no clue what it is until it is served. 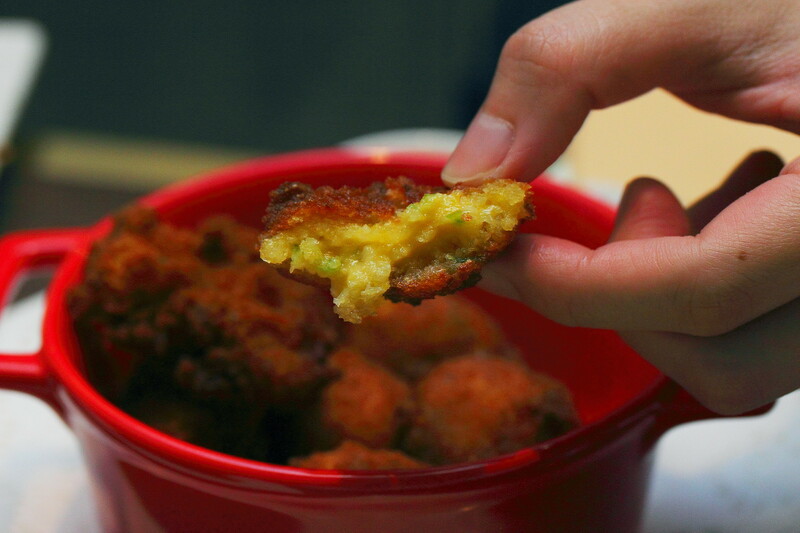 The ball shaped deep fried cornbread ball has a mashy interior and a crispy exterior. This is another American rooted dish attributes to hunter, fishermen or other cooks who could fry some cornmeal mixture and feed it to their dogs to "hush the puppies" during cook-outs or fish-fries. The dessert menu is less exciting with your usual items. Let see how the fare in terms of taste. 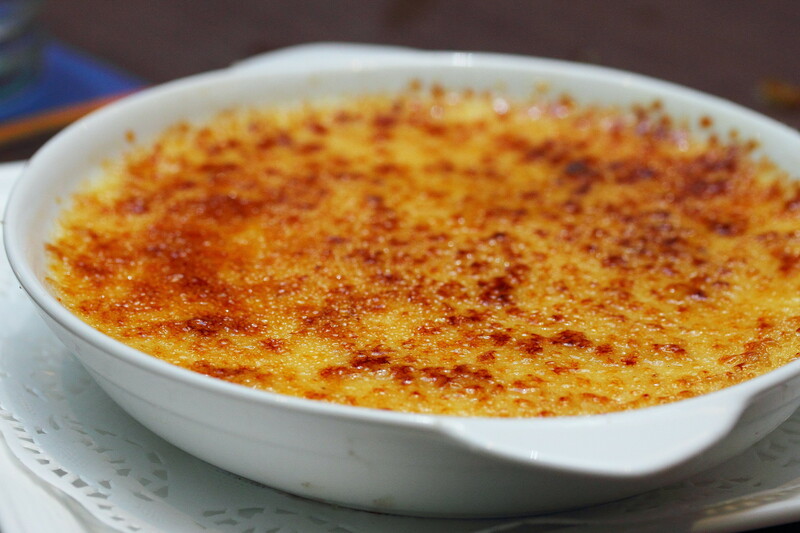 We started with the Creme Brulee ($12), which is really good with a rich custard base that is not too eggy and blanket with crackling caramelized crust to give it a bit of the bitter sweetness. 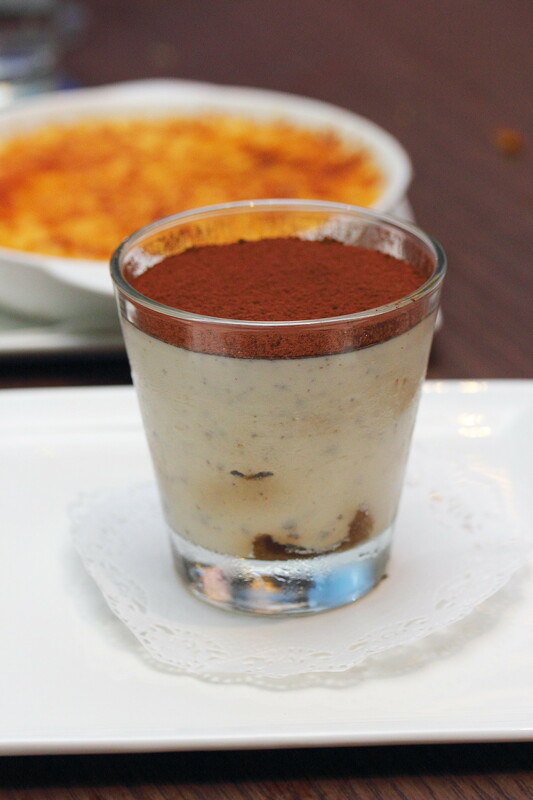 The ordinary looking Chocolate Chip Tiramisu ($12) hit me with its intense coffee flavour in a good way. Being a coffee lover, I love this version with occasion bites of chocolate chip as I dug into the glass. 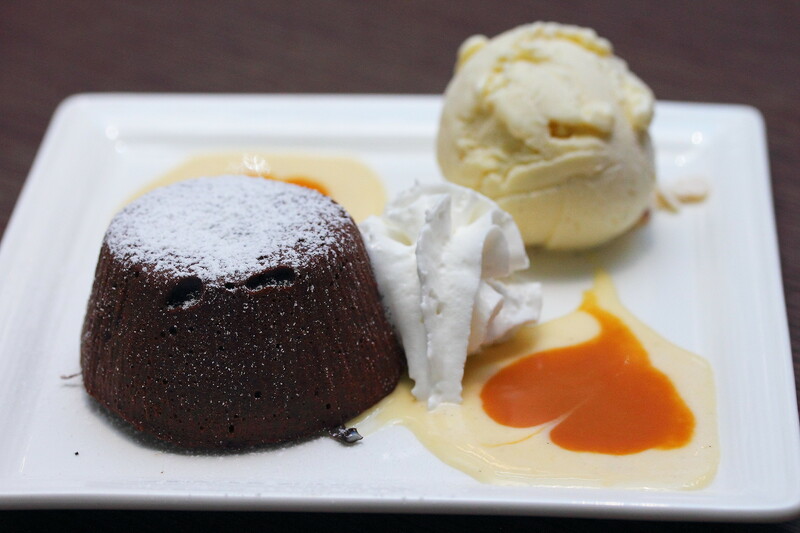 The Chocolate Lava Cake ($12) is an all time flavourite among many diners, especially chocolate lovers. Paired with a scoop of vanilla ice cream, to give it a nice closure to a satisfying meal. 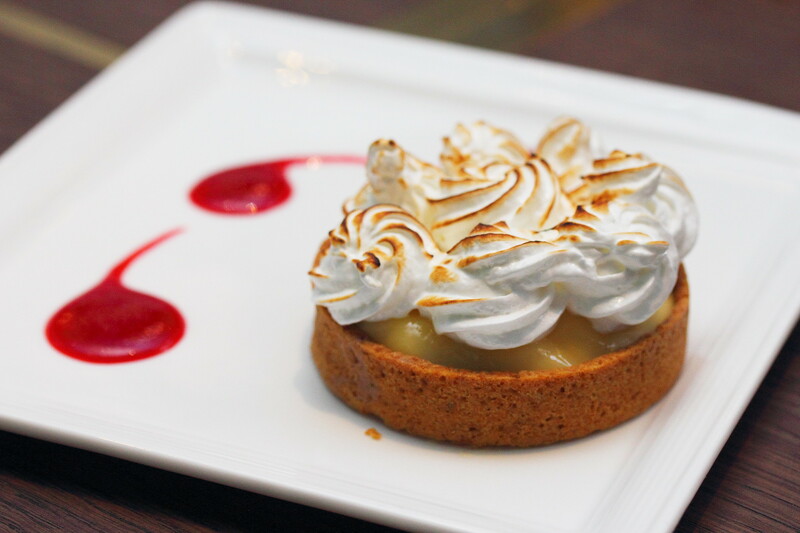 After all the grilled food, the Lemon Pie ($12) is actually a welcoming citrus dessert to remove all the greasiness and freshened up the palate. 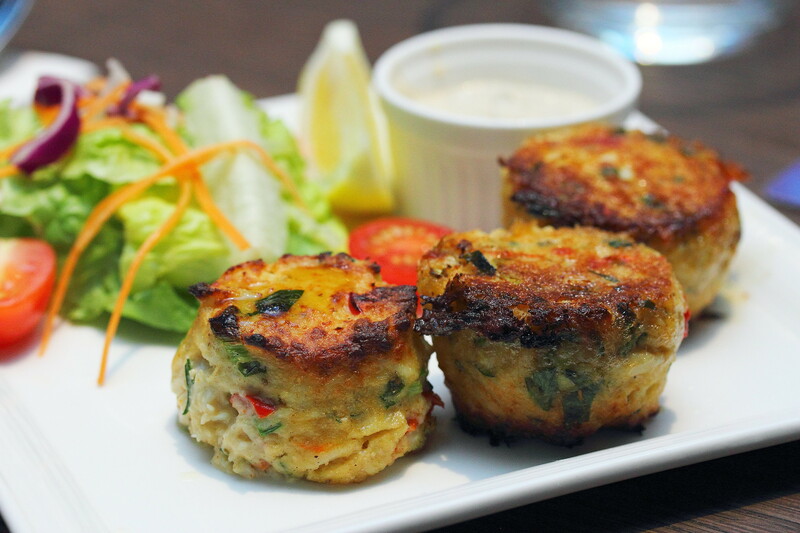 Redbank is a casual dining restaurant that is suitable for both family as well as corporate diners. I like the spacing between diners which is spacious and allows diner's privacy. Adding to the atmosphere there will be live band at the stage on selected nights and weekends. Sports fans can rejoice with the TV on one wall and life size screen over at the stage over at the other end too.